The Malabar Parakeet (Psittacula columboides) - also known as the Blue-winged Parakeet - is native to India where it is still locally fairly common - though their numbers have decreased due to loss of habitat and trapping for the pet trade. The range of this species is less than 50,000 square kilometers and, hence, it is classified as a "restricted-range" species by the IUCN. The chief threat to this species, as in the case of the Alexandrine Parakeet, is poaching for the illegal pet trade. They are most common in Southwest India, Western Ghats strip south-western India, north to Bombay, south to Kerala. Because the Malabar Parakeet is known to raid crops in some areas and can be injurious to orchards, they are considered pests in some locations. These parakeets are social birds and live in small groups composed of four to five individuals. On rare occasions they may be observed in small flocks. They are fairly noisy and are often heard before they are seen. They generally make their homes atop tall trees in humid deciduous and evergreen forests. In their natural environment these birds have been observed eating berries and other fruits such as figs, flowers, leaf buds, pollen, seeds, small nuts, and nectar. 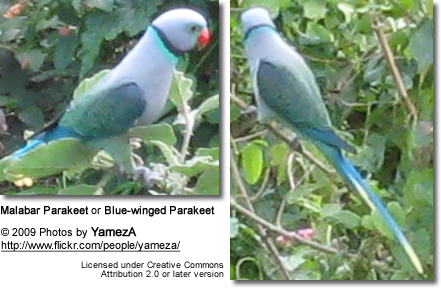 The species probably shares a common ancestor with the Layard's parakeet (Psittacula calthropae) which is endemic to Sri Lanka. The average adult Malabar Parakeet measures 15 inches (38 centimeters) in length. The Malabar Parakeet has beautifully colored plumage. The male's overall color is a bluish-gray with a sometimes reddish-pink tint. One of the things that make this bird so striking is the double ring around the neck of the male. The lower ring is a brilliant light blue, while the top ring is more of a greenish dark gray color. They have green feathers in front of their eyes, which extend towards their beaks. The plumage on their heads is bluer in color than the rest of their bodies, though it gets progressively lighter at the top of the head. Above the nares and on the cheeks the blue color is more distinct. They have a striking bright red beak with a bone-colored tip. The female Malabar Parakeets lack the brilliant blue band around their necks. Males generally have a greener casting to the feathers on their foreheads, and female's heads are gray. The bill of the female is black, as opposed to the brilliantly color bill of the male. Young / immature parakeets can be distinguished from adults by their orange beaks. They have plumage similar to that of the female, after their first molt they get their adult plumage, and their beaks will change to red for males and black for females. 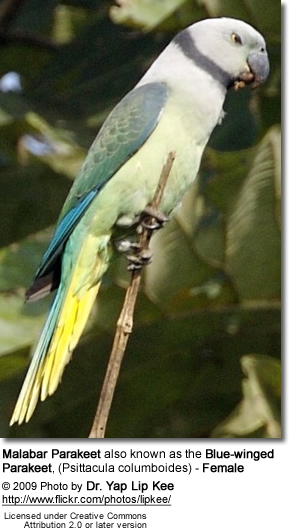 The Malabar Parakeet is not easily bred in captivity. Males are also sometimes aggressive to females. A clutch usually consists of 3 to 5 eggs, which the hen incubates for 23 days. The chicks fledge when they are about 3 weeks old. 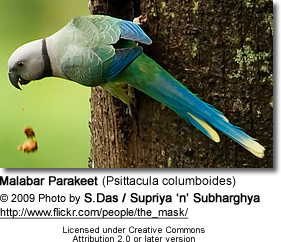 In the wild the breeding season of the Malabar Parakeet begins in January and lasts through March. They generally nest in tall trees, taking over the nests of other birds. The Malabar Parakeets are fairly uncommon in the pet trade. They are reported to be moderately noisy, which is to be expected of most parrots. If you have a wild caught individual, they may be shy at first and will take some time to adjust. Like many parrots they seem to enjoy chewing and will often chew lightly on small branches. They are usually most active in, and suited for, larger aviaries. These parakeets are reported to do well on a variety of foods, including millet spray, fruit, vegetables, seed mixtures (with minimal sunflower), oats, and millets.